NASHVILLE, TN — Briana “Hoops” Green has loved basketball since childhood, and began playing the sport as a four-year-old growing up in Kentucky. But she acknowledges that never in her wildest dreams did she envision one day becoming part of a legendary team. 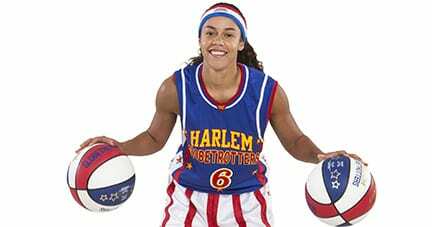 Green is the 15th woman in history to be one of the Harlem Globetrotters, an organization whose history dates back 91 years. She’s on of their three units, and since 2017 has enjoyed traveling the world, entertaining fans, and performing some of their famous tricks and maneuvers. Green’s forte is ball handling and dribbling, and fans who attend Saturday’s Globetrotter games at Bridgestone Arena, will see exactly how she fits into their current regimen. In some ways a lot of what she does resembles some of the things that the amazing Curley Neal used to do as far as dribbling in all sorts of situations, making fancy passes and doing uncanny stunts. “I’m sort of like Curley with hair,” Green laughed while explaining her role in current Globetrotter games. Green credits her older brother for getting her a fast start in the sport. She was a star at Catholic High School in Lexington, Kentucky. Over a four-year period, Green led the team to a 160-14 record that also included a pair of state championships. In addition she earned both All-State and All-Region honors. From there she went to the University of Texas El-Paso, finishing her career ranked 11th all-time among UTEP women players with 79 wins, while scoring 650 career points. See the world famous Harlem Globetrotters at Bridgestone Arena Saturday at 2 p.m. and 7 p.m. For more information about tickets visit Bridgestone Arena at 501 Broadway, Nashville, TN 37203 or call 1-866-456-8499.